Join the discussion on our forums! Come discuss Smuggler's Run over in our dedicated Smuggler's Run discussion topic. Give all minions in your hand +1/+1. One of the most famous busts in Gadgetzan’s history happened on Smuggler’s Run, where Sergeant Sally apprehended a cadre of Grimy Goons transporting a massive number of illegal fish heads. Does this card count as casting a spell on your minions? This card is kind of like a weaker Wild Growth. Giving minions in the hand +1/+1 is almost like having a 1 mana ramp into larger minions. Wild Growth is stronger because the ramp affects all cards in the deck, whereas Smuggler's Run only applies to minions in the hand. Wild Growth also gives card draw in the late game, whereas Smuggler's Run may have no minions to buff in the hand in the late game. 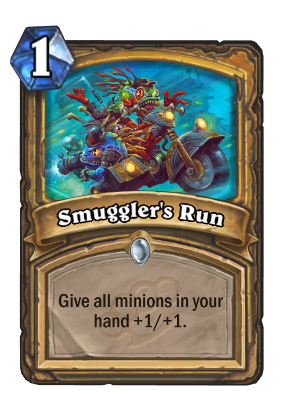 But in the middle game, Smuggler's Run can be slightly better than Wild Growth. It's definitely an interesting ramp-like mechanic for Paladins. Genuinely curious, why is this post negative? I thought it was a really good comparison. As I observe community is sick. When I leave a troll comment people are giving upvotes but when I talk about something obviously correct people giving downvotes. Hearthpwn comment upvotes or downvotes are not really a good source to see if we are correct or not. Hearthpwn is a great place but comment section is a bit gross to me. I also dislike twitch chat. Okay where are my downvotes now? http://www.hearthpwn.com/decks/697704-grimestreet-controll-pally check my deck guys :) Ty. 1 mana 9/9. The value!! Smuggler's Run at turn 1 into double Argent Minibot on turn 2. Turn 5: Doppelgangster as three 5-5's. Competitive Spirit took a hit! It's super effective! There's a lot of these mass +1/+1 effects overlapping with Paladin now. Not sure if this one is better than the 2 cost 1/1 minion since that would benefit from a chain of these buffs but this spell would not. Murlocs with hats. Hearthstone is becoming Team Fortress 2. I wonder if you get a bonus for finishing it in less than 12 parsecs? What would a murloc gang be called?